The 2010 Quality of Life Index boasted that Canada’s “health care and living standards are among the highest in the world.” Ask your average Canadian and they would probably agree. Ask an Aboriginal person and you would be in for quite a shock. Third world conditions exist in Canada – what an outrageous claim to make about the country ranked 9th best place to live in the entire world. When you consider the unacceptably high tuberculosis (TB) rates among the country’s Aboriginal populations, this claim is not outrageous, but instead, the cold hard truth. Recent headlines from The Globe and Mail (here and here) warn of the epidemic rates of TB in Native communities (31 times higher) and Inuit communities (186 times higher). What is most deplorable about this reality, however, is the fact that the government has been aware of this crisis for more than a century. Why, you might ask, is this a government problem? Firstly, the government’s legislative responsibility to its ‘Indian wards’ was clearly outlined in the 1867 BNA Act (which placed Indians and Indian land under federal jurisdiction), the 1869 Gradual Enfranchisement Act (which contained a provision for government aid to sick and destitute Indians), the 1876 Indian Act and subsequent amendments (which defined who an ‘Indian’ was and their relationship with the government), and finally, the ‘medicine chest clause’ in Treaty No. 6 (which promised aid should the Indians be overtaken by any pestilence or general famine). Secondly, and most importantly, the history of colonialism in this country has relegated Aboriginal peoples to a position as ‘citizens minus’; a position where systemic poverty, poor sanitation, and a lack of adequate medical care have allowed a 19th century disease to wreak havoc in 21st century Aboriginal communities. In 1891: an Indian Agent from Manitoba informed the Department of Indian Affairs (DIA) that “the change from a roaming life to residence in houses on reserves has the effect in many of inducing consumption (TB).” The government continued to push Natives onto crowded, unsanitary reserves. In 1907: Dr. Peter Bryce (Chief Medical Officer of the DIA) concluded in his survey of residential schools that “69% of ex-pupils are dead, and that everywhere the almost invariable cause of death given is tuberculosis.” He was relieved of his post a few years later. 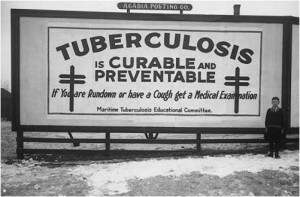 In 1931: after two years of providing medical services to the Copper Inuit, Dr. Russell D. Martin reported to the Department that “25% have died within the last year, and another 25% more have contracted tuberculosis”. He was relieved of his post a few months later. In 1934: the annual report of the Canadian Tuberculosis Association warned of the ‘problem of Indian tuberculosis’: “The Indian reserves are reservoirs of infection and a menace to the surrounding White population.” The Indian is classified as a disease menace, but conditions on these government established reserves are not questioned. In 1946: Neil Walker, an Indian Superintendent in the Fort Vermilion area, stated: “If I were appointed by the Dominion Government for the express purpose of spreading tuberculosis, there is nothing finer in existence than the average Indian Residential School.” Nearly 40 years after Dr. Bryce’s first inspection of schools, tuberculosis has still gone unchecked by the government. In 2006: Phil Fontaine, the national chief of the Assembly of First Nations, warned of the contemporary realities of TB: “In Canada, rates of infection are 10 times higher on Native reserves. In some northern communities, up to half of the population is infected. This is simply unbelievable and unacceptable in any community in Canada in the 21st century.” The alarm bells are still being ignored. Perhaps we can excuse the policies of government officials a century ago – when notions of scientific racism, the widespread belief in the theory of the ‘vanishing Indian’, and an aggressive federal policy of assimilation went unchallenged. There is no excuse in the 21st century. We cannot afford to forget these lessons of history. Epidemic diseases do not magically float off into thin air. The concentrated public health efforts and treatment programs that helped stamp out TB in non-Native populations must be adopted (in consultation with Aboriginal leaders and communities) and adapted (based on cultural and geographic differences) to do the same for Canada’s First Nations. The Globe and Mail should be commended on its coverage in recent weeks (and years) of this ‘needless epidemic’. Sadly, heightened news coverage has yet to shock the government into action. I fear that until tuberculosis becomes a ‘menace’ to white society again, a disproportionate burden of this disease will remain on the shoulders of this country’s original inhabitants. Reserves and remote northern communities have been invisible to the average Canadian, and the politicians who serve them, for far too long. It is time our country owns up to its colonial past and eradicates this ‘needless epidemic’ once and for all. Jane Whalen is a PhD Candidate in the Department of History at Wilfred Laurier University. Her dissertation examines the impact of policy and policymakers on the rise of tuberculosis in Aboriginal communities from 1867 to 1945. Very interesting article and I assume it’s just a snippet of a very sad history that touches all Canadians in some way, despite our unwillingness or inability to recognize it. I’m curious especially about in what specific ways we might feel the government has failed? A lack of immunization for the young? A failure to address housing issues including overcrowding and poor ventilation? Are there more? I personally have never been overly clear on housing policies on reservations, which I’ve seen under the spotlight in previous examinations of the tuberculosis problem in Canada. I will always remember one (CBC?) report’s video documentation of a 2 room portable that housed 16-18 Inuit extended family members on a permanent basis, not counting possible guests for the night. Unfortunately, my research over the years has never provided me clear answers on the complexities of housing issues on reservations. One particular question that has always arisen in my mind is related to corruption and local authority. Have the more modern de-evolutions of federal oversight and transfers of authority to many reservations themselves also left Natives on some reserves as the victims of their own leadership and their housing/health policies as well? What is the problem with housing in general anyway?